Passenger buildings and platforms demolished. Base of signal box , parts of stone loading dock and coal drops extant. Notes: This little-known station has all but disappeared, yet its purpose was to serve one of Britain’s most celebrated Prime Ministers and his family, and Queen Victoria and Prince Albert, no less, were among its passengers. For many years, at the behest of the great landowning family, Scottish expresses would call at Little Mill whilst omitting far more important stations on the East Coast main line. Despite its early status, Little Mill station was to suffer the ignominy of closure during the Second World War as by then it was so little used, and it disappeared from the timetable in 1958 along with nine other wayside main line stations in Northumberland. The route of the East Coast main line (ECML) through Northumberland, and the history of two of its stations, reflect the influence of the aristocratic Grey family. They owned the country houses of Howick Hall and Fallodon Hall and the surrounding estates, both of which are close to the coast and would potentially crossed by a railway route from Newcastle to Berwick. Probably the most illustrious member of the family was Charles, 2nd Earl Grey (pictured left) (1764-1845) who rose to be Prime Minister from 1830-34; he is celebrated by the monument in central Newcastle and has an aromatic tea named in his honour. 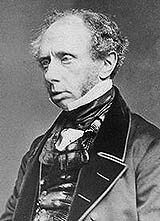 Under his premiership the Great Reform Act of 1832 became law. Some years later the Northumberland Railway was at the planning stage, and it would pass through the Grey family’s land between the Long Walk of Howick Hall and the sea. Earl Grey protested and visited George Stephenson, engineer to the project, to insist that his private property must not be violated, and Grey suggested that the line should be re-routed west of Howick Hall. 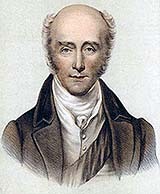 As eventually opened in 1847 the Newcastle & Berwick Railway did indeed pass to the west of the hall, but by then the 2nd Earl had died, and it was to be his son, Henry George, 3rd Earl of Howick (pictured below), who enjoyed the privilege of a private station at Little Mill, about 1½ miles west of Howick Hall, and had the authority to demand that expresses stop at this station for his family and guests to join or alight. The Grey family was provided with a second private station four miles north and close to Fallodon Hall, serving Sir George Grey. 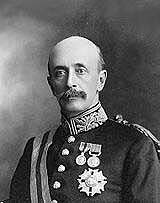 The influence of the family was exerted on the North Eastern Railway in the late nineteenth and early twentieth centuries as two of its members were directors of the company. The private station at Little Mill opened with the line in 1847. The building, on the down platform, north of the level crossing, was one of the dignified Gothic ‘Jacobethan’ designs by Newcastle architect Benjamin Green, and it bore a strong family likeness to the other Newcastle & Berwick stations. 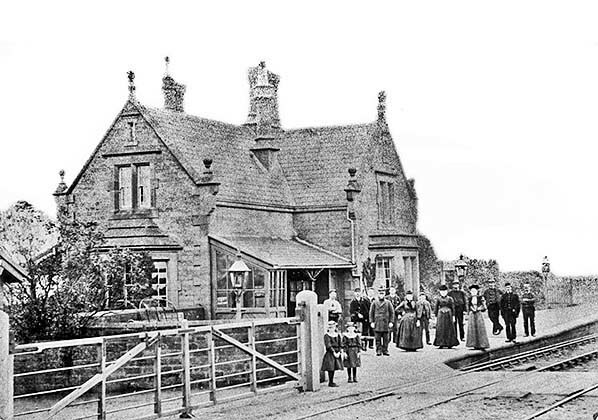 However, it was one of the smaller buildings, comparable to the crossing keepers’ houses at Forest Hall and Plessey - stations were opened at both locations in the 1850s - and the Grey’s other private station at Fallodon. The building cost £741 to construct, compared to £696 at Fallodon and £1,129 at Killingworth, a more typically-sized N&B station building. An attractive sandstone ashlar structure was provided at Little Mill with the N&B’s characteristic canted bay facing the platform, raised gables, ball finials and tall chimneys. The ground floor of the two-storey house contained the stationmaster’s kitchen (with the bay window onto the platform), scullery and toilet, and there were two bedrooms upstairs. At the southern end a single-storey wing with a south-facing bay contained a private waiting room, which later was used by first class passengers. An awning supported on cast-iron columns and ornamental brackets stretched along the exterior and platform faces of this room. In January 1861 Little Mill became a public station and first appeared in Bradshaw. An upper storey, containing a bedroom, was added to the southern wing by the NER in 1882. A third class waiting room was in a lean-to shelter against the yard wall. A single-storey northern wing contained a pantry and lobby, and the adjoining yard had been roofed over by 1882. It seems that at first there was no platform on the up line. If Earl Grey wished to join a southbound train it switched tracks to call at this platform, and continued to do so even when the up platform was provided because it had superior waiting facilities. On the up platform an austere single-storey stone building with a pitched roof was constructed. In its extended form it included a booking office, waiting room, ladies’ room and a goods store. In front a curious open waiting shelter was constructed, notable for its huge wooden brackets and glazed end-screens which supported the roof. A stone-built structure containing the gentlemen’s toilet stood immediately north of the booking office building. 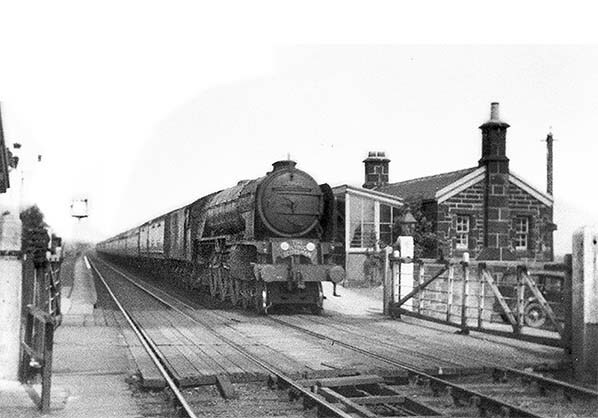 Queen Victoria was the station’s most distinguished visitor, alighting from a southbound train on 27 September 1849 to stay overnight at Howick Hall. It was not originally Her Majesty’s intention to stay here, but arrangements for her to stay at Perth that night - on her way south from Balmoral - were abandoned in response to an outbreak of cholera in the town. At Balmoral Countess Grey received her instructions, and she left on 25 September to make arrangements for Her Majesty’s accommodation, followed south to Howick by her husband, the Earl, who had been in official attendance on the Queen. The station at Little Mill was already embellished ‘with great taste and elegance’ to welcome the Queen, as her original plan was to alight here to take luncheon with the Earl and Countess. York, Newcastle & Berwick Railway archives disclose that the platform was covered by ‘a handsome awning, the entire length of which was festooned with bright blue and white chintz, while the platform was adorned with crimson cloth’. The decorations were ‘effectively lighted up, and altogether presented the idea of a neat pavilion or saloon. A detachment of police … had been forwarded … to guard the royal family from improper intrusion.’ On the royal train YN&B directors, who had joined at Berwick, presented the Queen with ‘a beautifully illustrated map of the railway, executed by Mr Andrew Reid [proprietor of the company which, for many years, produced railway timetables]. It was printed in gold, on enamel paper, mounted on rich white watered silk, elegantly bound in purple morocco. With antique boards indented in the centre, beneath which [were] the royal arms executed in crimson velvet.’ After the 13-hour journey from Balmoral Her Majesty was ‘labouring under considerable fatigue’ and had to rest awhile before joining her hosts for the evening’s dinner party. The following day, Her Majesty’s departure shortly after 11.00am from Little Mill station was witnessed by ‘a great number of persons’ as she continued her progress to Newcastle for the opening ceremony of the High Level Bridge. The neighbouring farmstead from which the station took its name is ‘Littlemill’, and this form of the name was used for the nearby quarries and Ordnance Survey maps always rendered the station’s name as a single word. However in railway annals the station was always ‘Little Mill’. A station of the same name opened in Monmouthshire in 1854, but the North Eastern Railway – usually showing an aversion to any of its stations sharing a name with another on its own or any other company’s lines – retained the name of Little Mill. Today the traditional railway form of the name is continued on the sign ‘Little Mill Junction’, where there is a crossover between the up and down tracks, however an installation at the level crossing has a ‘Littlemill’ nameplate. A temporary signal cabin was installed at Little Mill on the down side just south of the level crossing, and by October 1875 a permanent structure had replaced it: an NER N1 design in stone, at first with a 14-lever frame, adapted to 35 levers in 1912 and 41 in 1944. 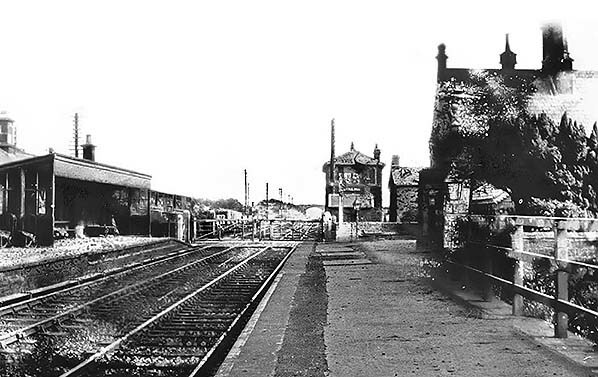 Soon after the railway opened a connection was built to the Littlemill limestone quarries and lime kilns, just south of the station and west of the main line. Jermy (2012) devotes 18 pages of his excellent book (see bibliography) to the history of the quarries and kilns and their railways. The connection and sidings enabled coal to be brought in to roast the lime and the roasted product to be dispatched. The lime was used to improve the fertility of farm land. In the late 1860s a whinstone quarry was developed immediately south of Little Mill station, but east of the main line – thus facing the existing limestone quarries and kilns across the railway tracks. By 1906 the whinstone quarry was served by a branch which led north to four sidings and a loading dock adjacent to the level crossing, and there was a southward-facing junction from these sidings onto the up main line. Again one of Jermy’s books (2011) – see bibliography – deals in detail with this quarry and its railways. The RCH Handbook of stations (1904) indicates that Little Mill handled a limited range of goods traffic and that a one-ton crane was installed. Sidings are noted serving lime kilns and the whinstone quarry. NER records for 1913 refer to roadstone, building stone, and manure being dealt with and 300 wagons of livestock dispatched from the station. The stone shipments are thought to have peaked at this time, and the sidings at Little Mill shipped 12,678 tons of roadstone and 8,443 tons of building stone in 1913. Jermy suggests that in addition to the whinstone from the quarry close to Little Mill station, this total might have included stone from other sources, for instance Craster Quarry. If passengers from Little Mill were travelling to destinations south of Alnmouth, they could alight at that station and join a conveniently timed Alnwick-Newcastle service. The first northbound departure of the day is shown to run as far as Beal; this train waited at Beal for about half-an-hour, moving off the main line to enable a northbound express to call, before completing its journey to Berwick. Passengers on the 9.55am ex-Little Mill could change at Belford or Beal to catch this faster train to Berwick and onward to Edinburgh. In 1920-21 additional ‘Down’ and ‘Up independent’ lines were constructed by the NER from Little Mill to Stamford Crossing, one mile north, to increase track capacity and enable slower-moving freight trains to be overtaken by passenger trains. Similar arrangements were made on other sections of the ECML in Northumberland: see the chapter by Mackay in Addyman [Ed] (2011) pp77-78. The morning train advertised as terminating at Beal was a particularly durable feature of the timetable having been seen in the 1912-13 departures. The afternoon train shown as working to Christon Bank continued to Berwick after 17 minutes, allowing a northbound fast train to pass. Presumably it was advertised as a different train for the remainder of its journey as passengers would not officially be permitted to stay on board when it was moved off the main line during its rest-over at Christon Bank. The timetable shows this train to be one class only, so it was presumably a steam railcar or a push-and-pull, which would have made the manoeuvres at Christon Bank straightforward. The winter 1950-51 timetable showed an up departure at 5.52pm to Newcastle, but by winter 1951-52 this had been discontinued. The later Saturday departure of the second morning train was caused by a call at Christon Bank which was omitted on Monday-to-Friday, and similarly a Saturday-only call at Pegswood was the reason for a 3-minute later evening departure from Little Mill. From June 1954 trains ceased to call at Little Mill on Sunday. In summer 1958 Little Mill was left with only two weekday morning up departures, and a morning and late afternoon departure in the opposite directions. 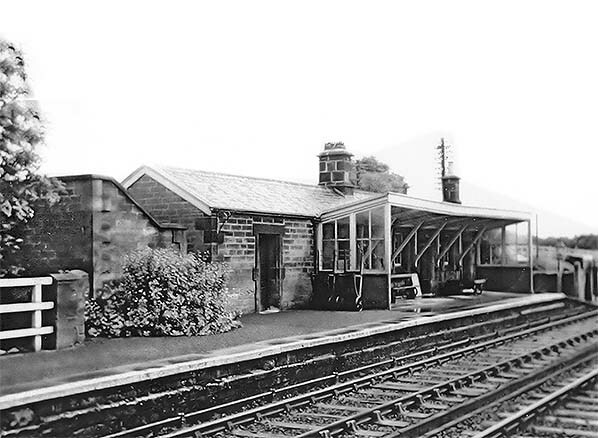 Little Mill station closed to passengers on 15 September 1958 together with nine other intermediate stations between Newcastle and Berwick. Goods services were retained, however, until 7 June 1965. In 1966 the ‘independent’ lines north from Little Mill were taken out of use, to be lifted in July 1967. The station buildings were demolished within several years of closure to passengers. The main line connections to both the limestone and whinstone quarries were removed in the late 1960s. A fragment of the back wall of the up platform building was still standing in the 1980s, but now there is scant evidence that the passenger station ever existed. The crossing gates were removed and barriers installed in their place on 23 July 1967. Little Mill signal box was abolished on 16 April 1978 but the base was retained as a relay room, while the crossing was brought under the supervision of Alnmouth signal box by CCTV. The large, disused lime kiln, several hundred yards south of Little Mill level crossing, survives and can be seen from passing trains. It has been given Grade II* listing. Little Mill station c1905. In this view, looking north-west from the level crossing, smartly attired passengers accompanied by station staff are on the down platform. The Newcastle & Berwick Railway’s station building of 1847 is shown to advantage. 1865 1: 2,500 OS map. The station is called Littlemill on this and other OS maps, while its official name was Little Mill in railway annals. The main building on the west (down) platform included private facilities for the Grey family of Howick Hall. A subsidiary building is shown on the opposite platform. South of the level crossing, on the up side of the main line, Littlemill limestone quarry and the associated kilns are reached by several sidings. 1897 1: 2,500 OS map. The buildings on both platforms at Little Mill appear much larger than on the earlier map. The signal box is shown immediately south of the level crossing, west of the tracks. Further south, on the same side of the main line, the quarries have expanded, but one of the kilns has been abandoned, and the layout of sidings has undergone minor alterations. East of the main line a whinstone quarry has opened since the earlier survey with its associated sidings, two of which extend to the lane for onward transport by road vehicles. A crane is installed next to these sidings. The coal depot is reached by the adjacent siding where a weighing machine (WM) is named. The siding closest to the up main line serves the goods dock. Click here for a larger version. 1923 1: 2,500 OS map. An extra track has been added north of Little Mill; this is the ‘Down Independent’ constructed in 1920-21 to accommodate slow-moving northbound freight trains, enabling faster passenger trains to pass them. The new line stretches as far as Stamford Crossing, ¾-mile north of Little Mill. Interesting detail is shown of ‘tramways’ within the limestone and whinstone quarries. 1957 1: 10,560 OS map. The station remains open for passenger traffic, but would close the following year. Goods facilities would be maintained until 1965 and the sidings are shown trailing from the up line, south of the level crossing. Quarrying activity has ceased and the associated sidings and tramways have been lifted, but limekilns are still named. Whereas many sites of mineral extraction in Northumberland were accompanied by workers’ houses, the Littlemill quarries were not, and the countryside around the station is as sparsely populated as it had been when the railway arrived over a century earlier. 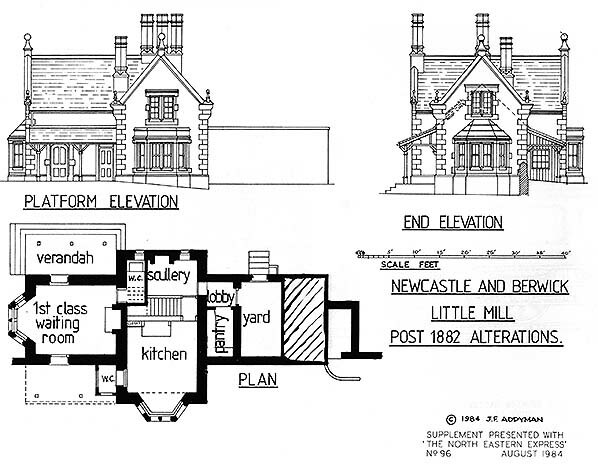 This line-drawing illustrates the station building at Little Mill after an upper storey, containing a bedroom, was added to the southern wing by the NER in 1882. Details of the structure including the quoins, window surrounds, raised gables, ball finials and chimneystacks are shown clearly on the Tudor/Jacobean building constructed for the Newcastle & Berwick Railway in 1847. 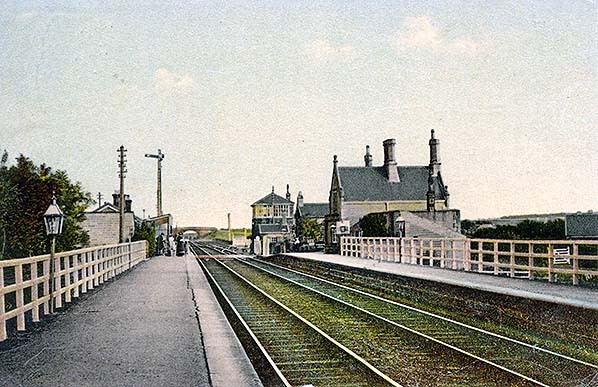 A tinted photograph of Little Mill station, looking south from the up platform c1910. The building on the opposite platform dates from the opening of the line in 1847, and for the first 14 years of its life this station was private, serving the Grey family of Howick Hall and their guests. The station house has the charm and dignity seen at all of Benjamin Green’s series of buildings on the Newcastle & Berwick Railway. It is constructed of sandstone and treated to numerous decorative touches, including bay windows, raised gables, ball finials and lofty chimneystacks. Beyond it is an NER N1-design signal box of stone construction. On the up platform the gents’ toilet block obscures the building containing booking and waiting facilities, but its verandah is seen close to the group of waiting passengers. In the distance, beyond the signal box, a siding is visible; this leads to the limestone quarries and kilns. Little Mill station, looking south from the down platform c1930. The station building is on the right and the booking office and waiting rooms on the opposite platform. The signal box is beyond the level crossing on the right. On the far left a rake of freight wagons can be seen on the elevated siding above the coal cells. The booking office and waiting room range on the up platform at Little Mill, looking south-east from the down platform c1953. The sandstone building is undistinguished when compared with the elegant Newcastle & Berwick Railway station house on the opposite platform, but its verandah is of interest; the pent-roof is supported by huge timber brackets and the glazed screen walls, and it appears to be sagging slightly. The gents’ toilet block, also of sandstone construction, is to the left of the picture. These buildings on the up platform were intended for the general public to use, while the Grey family – for whom the station was opened – used the superior facilities on the down platform. On 26 June 1953 No.60142 ‘Edward Fletcher’ hauls the up ‘Flying Scotsman’ through Little Mill station. The booking office and waiting room building with its verandah can be seen on the up platform. The Peppercorn-designed Class A1 4-6-2 locomotive was built at BR(NE) Darlington works in February 1949. On 14 June 1965 she was withdrawn from 52A, Gateshead shed, and cut up in July 1965 at Hughes Bolckows, Battleship Wharf, North Blyth.